25 Matching Words. YOUR BABY CAN READ. on 50 Cards. Condition is Used. 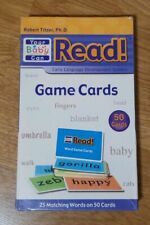 44 laminated sight word cards in clear plastic pouch. Each card has a hole in the left / top corner so you can pick and choose the words for the child to work on and put them on a ring. 23 laminated Bold Text Farm Vocabulary Word Wall Accessory flashcards. 23 Farm Vocabulary Laminated Flash Cards. Help expand a child's vocabulary by using words derived from a setting that a child enjoys. 25 laminated Fry high frequency sight word flash cards. Second Hundred List 2. 25 laminated Fry Second Hundred List 2 high frequency sight word flash cards. Designed and hand made by Annette Sutherland. 25 laminated Fry high frequency sight word flash cards. Second Hundred List 3. 25 laminated Fry Second Hundred List 3 high frequency sight word flash cards. Designed and hand made by Annette Sutherland. 25 laminated Fry high frequency sight word flash cards. Second Hundred List 1. 25 laminated Fry Second Hundred List 1 high frequency sight word flash cards. Designed and hand made by Annette Sutherland. 25 laminated Fry high frequency sight word flash cards. Second Hundred List 4. 25 laminated Fry Second Hundred List 4 high frequency sight word flash cards. Designed and hand made by Annette Sutherland. Your Baby Can Learn! Each of the 5 Special Edition DVDs contains at least 2 videos for a total of 11 Your Baby Can Learn! Lift-the-Flap Language Cards: 40 all-new lift-the-flap cards designed to teach important language skills. Lot of 24 of the larger size (7.5" x 7.75") Scholastic BOB books for pre-readers/early readers. Included is the complete set of 12 Alphabet books, and 12 other mixed books mostly from the pre-reader series with one each from collection 1 and collection 2. 4 years & up. Match each person's face to the emotion that fits. No part of the domino can touch a non-matching domino. 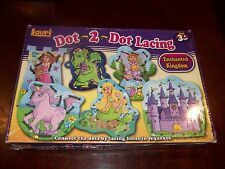 This set is complete and in very good condition. Up for sale is a Hanes Gateway Educational Products Hooked on Phonics White 2-Sided T Shirt Size LARGE. The shirt is Pre-Owned and in good condition. Size: Large. Length from shoulder to base: 27". Armpit to armpit: 21". 9 Retro Short Vowel Discs with fun colored frogs. Turn the disc, look at the picture on front, and check the vowel sound on back. It takes a village to raise an idiom. Making words a world of fun! Each 32 page workbook is educational & fun -each color page. ~Alphabet, Shapes, Numbers & Counting Workbooks~. (1) LEARNING THE ALPHABET teaches young learners upper and lower. (2) NUMBERS & COUNTING teaches Counting 1-20, writing numbers, count and color exercises, counting and tracing numbers. Everything you need to animate. Smooth Action Technology - Everything you need to Animate. Compatible with IOS, Android, and Windows Smartphones, Tablets, and iPod Touch. After downloading the free app, kids ages six and up simply hover their smartphone or tablet over the coloring page to import their character into the app. You will receive the exact item pictured. Batteries not included unless otherwise noted. Pencils - set of 6 and brick-shaped erasers - set of 4. Only used one or two times. In excellent condition. Complete. These large Sliding Phonics Cards can form more than 70 rhyming words by sliding a tab on the top part of the card. By pulling the tab on the bottom part, the child can match an image for each word. • Words Level 2. Excluded are Alaska, Hawaii, Puerto Rico, APO/FPO, PO Boxes and International locations. A couple of the crayons are broken, but otherwise, good condition. Sale is for exact item shown in photos. Main item unfolds to reveal multiple scenes/pages for learning and imaginary play. Set is complete with original storage bag, Elmo and other Sesame Street characters made of felt for easy stick-on and off application. Item in all-around beautiful condition, ready for learning and play. Excellent condition. Only used a couple of times. Books 1 thru 5, 7 thru 10. Well cared for and clean. 25 Matching Words on 50 Cards. There are directions and an answer key provided for each group of 37 cards. VSMILE, VSMILE CYBER POCKET, VSMILE VLINK. VTECH V-SMILE MOTION ACTIVE LEARNING SYSTEM. Help Tink learn an important lesson: Magical things happen when you believe in yourself! Also, works with SHAPES &MORE! VTECH V-SMILE SMARTRIDGE. SIMBA'S BIG ADVENTURE. PROBLEM SOLVING. Teach My Preschooler learning kit is the all-in-one learning system for preschoolers and kindergartners. This preschool learning kit provides educational tools that help prepare kids for future learning. See scans or photos for condition. All pieces are laminated and self-checking. 15 Slide Cards. Good Luck and Happy Reading! Cards are in good condition. This set contains. • Words Level 3. Excluded are Alaska, Hawaii, Puerto Rico, APO/FPO, PO Boxes and International locations. Me Reader Thomas and Friends Thomas Makes A Wish Book Replacement Book Only. Condition is Used. Shipped with USPS Media Mail. Fisher Price doodle Pro Trip. Slide Eraser. - Fine Motor. Condition is New.